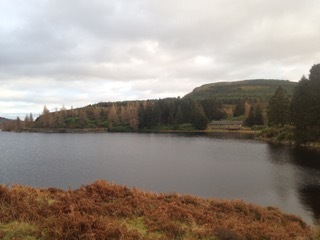 The second installment in Emm Cassidy’s volunteering blog. This is the second of three and this week Emm got to meet lots of dogs as well as the reindeer! I turned up at Reindeer House at 8am forgetting it was an 8:30am starts as it was a week day and I met Dave who is originally from New Zealand. When Imogen arrived she started doing some knitting, which I found interesting and I enjoyed talking about knitting with her as my Granny had knitted clothes for my teddies. With Imogen, I did poo picking in the paddocks whilst the others went to check the reindeer on the hill and give them their breakfast. Some reindeer had been in the extra paddock on the Saturday when it was the changeover day where they had been swapping reindeer from Tilly’s farm, the hill enclosure and the paddocks. One was Boris, a lovely reindeer with an odd shaped nose who is Mo’s cousin. We put out breakfast for Beastie, Ost, Aonach and Nutti (the 4 paddock reindeer) in 4 bowls and then put lichen on top of each. Imogen said we don’t mix the reindeer feed and the lichen together as the reindeer don’t like that. I went with Dave on the 11am hill trip. He wears a really cool green hat with a ptarmigan feather sticking out of it. When Dave did the introduction talk in the carpark, I realised that different reindeer herders had different sayings when they gave their talks. I thought that is really nice and makes the hill tour their own. When most people had gone, we started to make our way down to the enclosure gate. 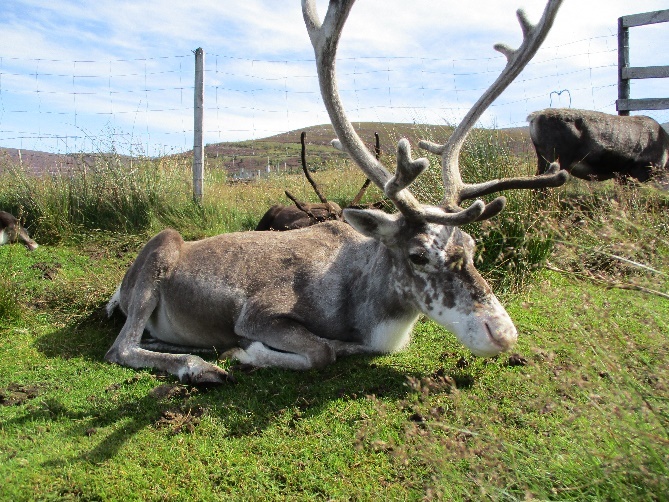 We found the reindeer relaxing and lying down again by the fence sunbathing! I was slowly identifying a few individuals too as I had been making notes on my herd list every time I go up there. I ate my lunch in the front garden looking out on to the mountains and trees with Fiona and we talked about lots of things. I then played fetch with the 3 dogs and they barked with excitement all wanting the toy – bless. On the 2:30pm hill trip, which I did with Abby, we met Fran and her mum. 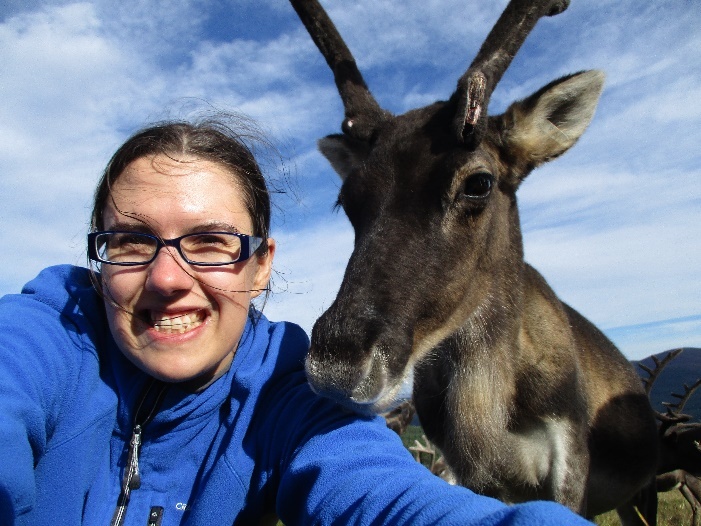 Fran is a research student doing a study on where the reindeer graze each day, with radio collars on 6 reindeer in the hill enclosure. It was very interesting and I was there when we took the radio collars off them and she showed me them and how they worked. She also had made them reindeer proof and weather proof. Fran found out why Bourbon (who had a radio collar on) had a poorly tummy by looking back at the data where he had been the night before. It turned out Bourbon was down in the forest eating the wrong type of mushrooms. Me and Fiona were on duty to give the paddock reindeer their tea and put them to bed in the woods. I put the dark grain pellets in their trough in their stable then went to get some buckets of reindeer feed and lichen. The reindeer were getting very excited as there was food so they followed me up to their troughs. Whilst I put out the reindeer feed and their lichen on top I had to dodge their massive antlers. It was quite funny as one reindeer was trying to eat from the bucket whilst I poured the reindeer feed in the trough. We then closed the paddocks for the night. Met Imogen’s dog called Brock, Dave’s dog called Tui and Alex (Fiona’s brother) and his dog Tip. At one point, there was 6 dogs in Reindeer House. 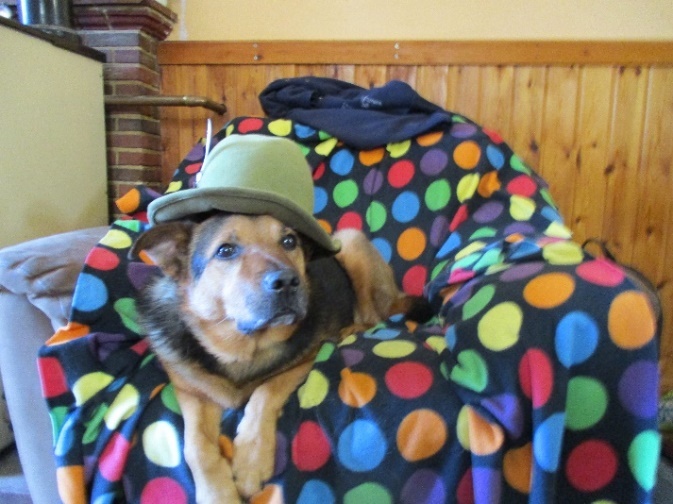 I put Dave’s hat on Brock and took a photo of him, he looked so cute. 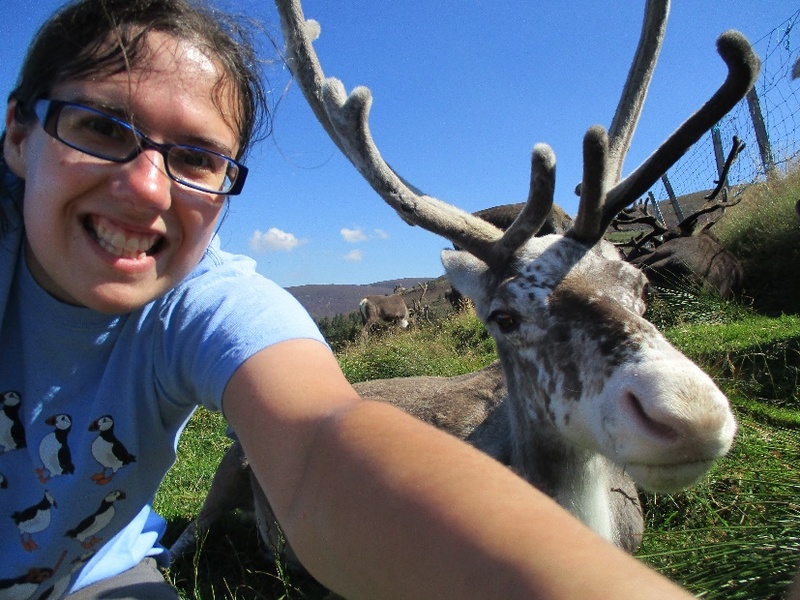 I met Sarah who is a part time reindeer herder. Later we separated 8 reindeer from the herd and Fiona showed me how to put a head collar on a reindeer which I enjoyed learning about. I put a head collar on Blue and Duke. In the shed, we had 5 yearlings which included Scolty and Bhuachaille, then a 2 year old called Baltic and the 2 older reindeer called Blue and Duke (the role models) who will show the younger reindeer how to be led and behave on a head collar. For training, we went on a walk around the top enclosure. I led Duke and Baltic up the hill. Baltic was stubborn at first but then Duke started trying it on as I was new to this. But by the top of the hill, Duke knew who the boss was and Baltic was happier with being led as he was getting used to it. The training is important for the reindeer as this will get them used to being handled, health checked and to become brilliant Christmas Reindeer. On my 2 hill trips today, I herded all the reindeer out the shed as they were all cooling off in the shade. The shed doesn’t look like it can fit 41 reindeer in but it does, it is like Doctor Who’s Tardis! 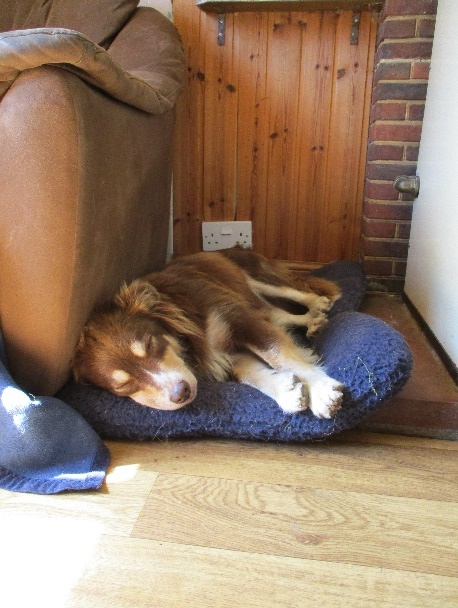 One time when I was herding them out of the shed, I realised that I hadn’t seen Blue, I found him by the shed asleep. 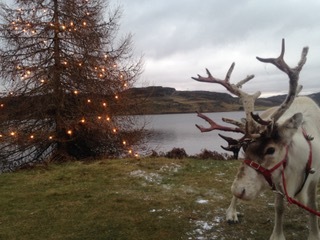 Blue, who is deaf, didn’t hear his reindeer friends move on – bless him. 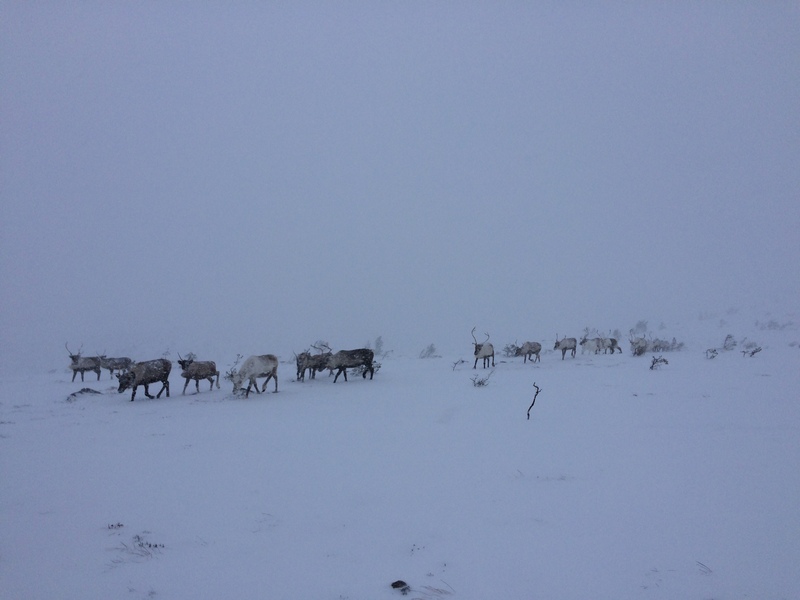 Near the end of the hill trip, the reindeer leisurely make their way up to the shed gate knowing they will be let back in soon. I really like this time as it is just us reindeer herders approaching them after everybody has left. We are met by reindeer lying down relaxing and sunbathing. I really enjoyed that quality time relaxing with them and sitting by them giving them some fuss, talking to them and getting to know them more. This is where I did my selfie with Mo! We then let them into the shed for shade if they wanted it before we went back down to Reindeer House. I also learnt the reindeer language today which Utsi did with the reindeer. 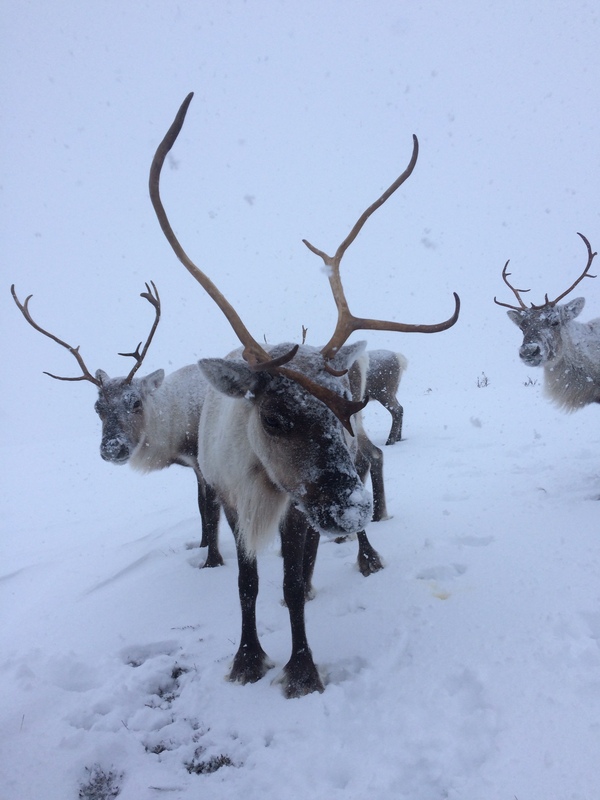 In the morning, we counted and herded the reindeer into the front enclosure and gave them their breakfast. Kota and Boxer didn’t seem themselves as they were very slow about moving into the front enclosure with the herd so we took them into the shed to check them over. They had their temperatures taken which revealed they both had high temperatures. That can be a bit dangerous for reindeer so Hen gave them both injections to bring their temperature down. Boxer then had an infected antler treated and then had sun cream on to protect his antler. We rewarded Boxer with some lichen. Kota and Boxer were so brave. We then put them out in the pen near the shed enclosure making sure they had plenty of food and where we can keep an eye on them. We then let the reindeer into the shed as Hen needed to fly spray (citronella) them to keep the flies and midges off their antlers. Hen did the spraying in two groups as it would be chaos if all the reindeer were in at the same time. Mo stood quietly in a corner behind me after he had his done as he realised if he kept running around that he would get more spray on him. I gave him a big fuss and talked to him saying he was a very clever reindeer. I did the introduction talk at the start of the 11am hill trip and the herd history talk at Utsi’s Bridge on the 2:30pm hill trip. That was such a massive thing for me to do. I was so proud of myself. Whilst I was poo picking the paddocks, mum visited and Imogen told my mum how well I had done that day with doing the two talks. Everyone was so proud of me and I was very proud of myself and I was getting so much more confident dealing with new people. In January, we are closed to the public, and it’s the time of the year when we all take the opportunity to take holidays and have a bit of a break. There’s still plenty to get on with though at the Centre – the reindeer are all free-ranging but we still feed them daily, if of course we can find them! At this time of the year their appetite is greatly reduced and the weather doesn’t always permit us to walk out onto the mountainside. If we can’t feed them, it doesn’t matter as they’re perfectly capable of finding enough food themselves, but its always nice to check them over and see that they’re all fine. 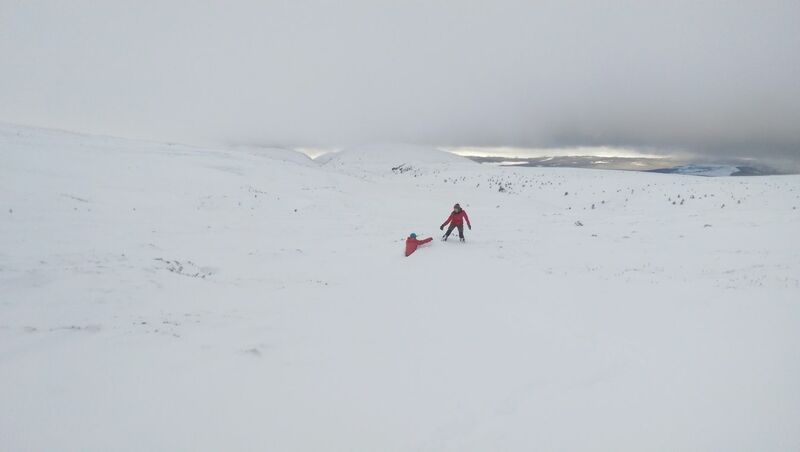 On snowy days, this can take two or three of us two or three hours, as we’re often breaking a track through deep snow, whilst carrying feed, to get to where the reindeer are. Calling the reindeer – the better your call, the less distance you have to walk…! 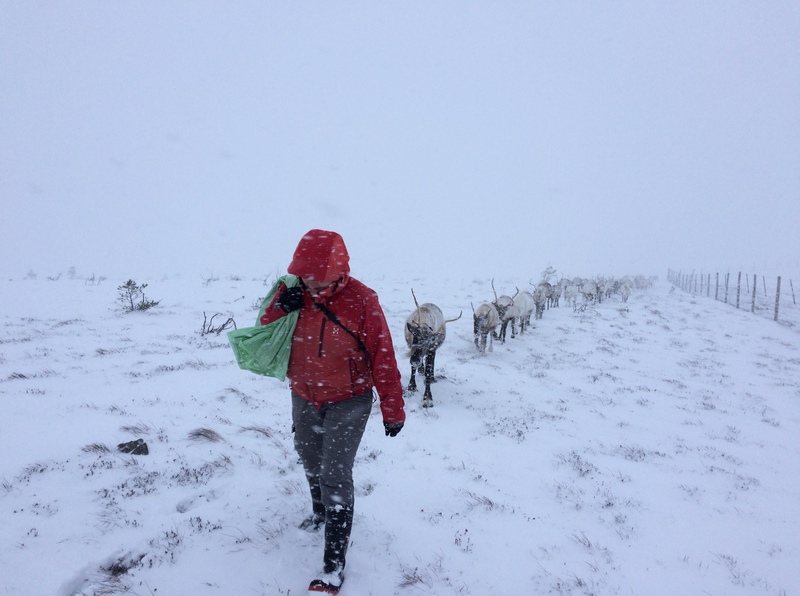 Not always the easiest of walks – reindeer may be designed for the snow but us herders aren’t! Hen’s call must have been good enough – the herd come to meet us. Follow the leader. This is on the outside of the enclosure fence line. Waiting expectantly for the food. Aside from feeding the reindeer, there is plenty of maintenance to do at the Centre, which we can’t really do whilst we’re open. 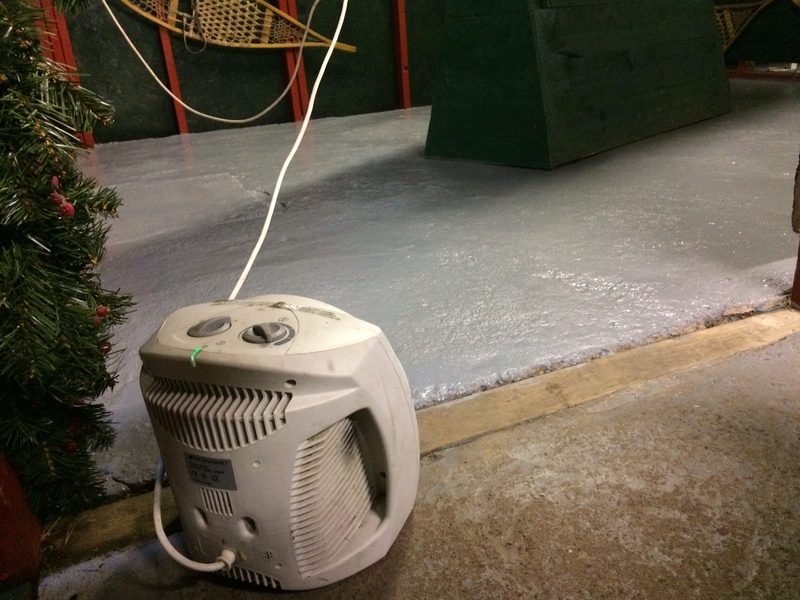 Painting the exhibition shed floor is a big job each January – it gets very worn over the course of the year so needs three coats of garage floor paint to smarten it up in preparation for all of our visitors over the coming year! It’s always entertaining reading the instructions on the paint can “Ensure the temperature is over 10*C”, then looking out of the window at the snow – anyone who’s visited will know that our exhibition shed is unheated, so it’s unfortunate that we have to do the floor in the coldest month of the year, when the temperature is mostly sub-zero. Our solution is to block off the doors and get a fan heater on, which helps, but I still wear a hat and gloves and take a cup of tea to help keep me warm! Coat one is well under-way, you can see how worn the floor gets. 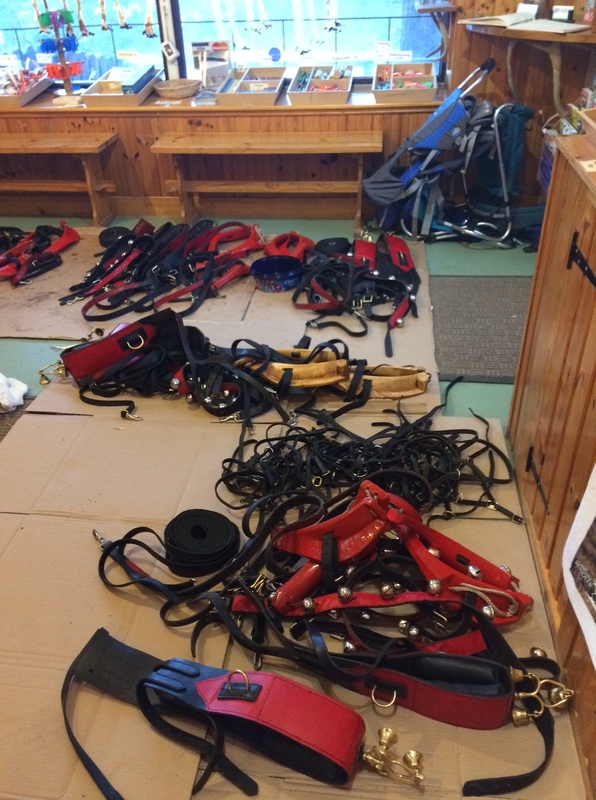 The other big job for me is to oil all of our Christmas harness and make any necessary repairs before it is popped into storage for the year. If you’ve met me, you may realise that I absolutely love order and lists, so organising harness is one of my favourite jobs. It’s also a little warmer sitting oiling harness in the shop than most of the other tasks. The shop is the only place large enough to do this really, which is another reason that its done whilst we’re closed, along with the fact that we’d never get round to it if we left it until before Christmas! The shop in its January role. There’s still also plenty of office work to get on with: making up adoption packs, answering emails, planning what gifts we’ll order to go in next year’s adoption packs, counting and reordering shop stock (again a delight for me as I get to make lists!). So whilst we may be a little quieter, don’t imagine we’re just sat around with our feet up! Perhaps the most important purpose of being closed to the public in January is that after a hectic Christmas season (in fact all of 2016 was hectic…) it gives both us herders and the reindeer a proper break and change in routine, which means that when we reopen in February we’ll be bright and bushy tailed, and actually look forward to meeting our visitors and introducing everyone to the beautiful reindeer! As a little winter treat to remind us of the better weather we had in the summer, we now have a series of blogs from volunteer and adopter Emm Cassidy who came to visit us in August. This is the first of three installments. We hope you enjoy! 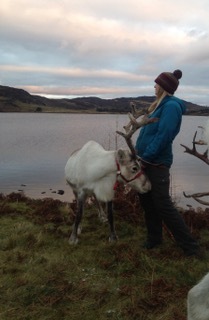 My name is Emm Cassidy and I was a volunteer reindeer herder for 6 days at The Cairngorm Reindeer Centre. It was such an amazing experience and meant so much to me and I really enjoyed it. 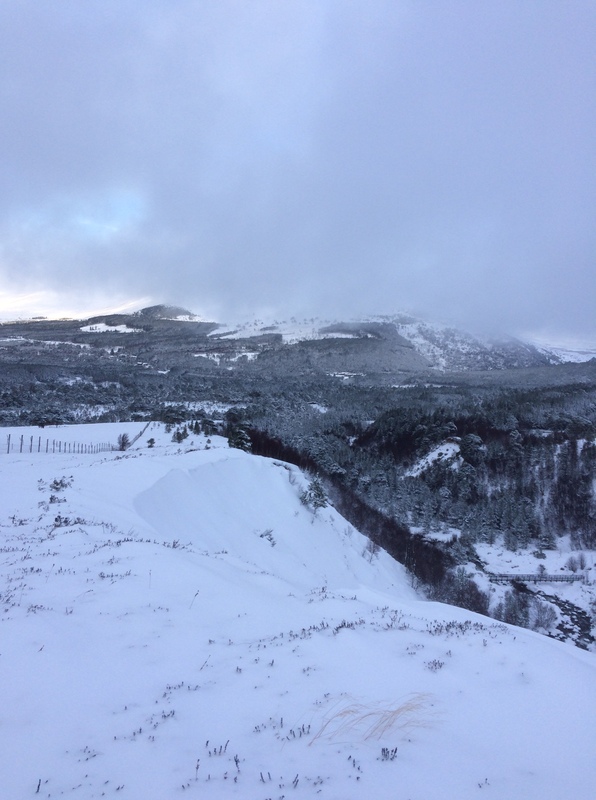 I have known The Cairngorm Reindeer Centre for 9 years now since my family stayed at Wild Farm Cottage in Glenlivet in August 2007 which is owned by Tilly Smith. 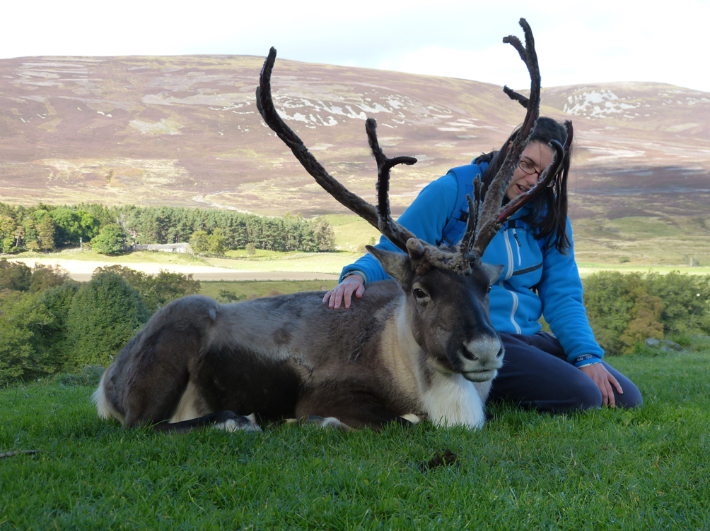 I was in my element meeting all the reindeer, feeding them and stroking them. I fell in love with a yearling called Dylan who then I went on to adopt for 6 years until he died suddenly of an undetected heart problem in September 2013. We came to the 60th Reindeer Anniversary Adopters Weekend in October 2012 and I had sat with Dylan fussing him in Tilly’s back garden at her farm and he was talking to me by grunting at me! It was such a brilliant, special and magical time. I now adopt Mo who is 4. 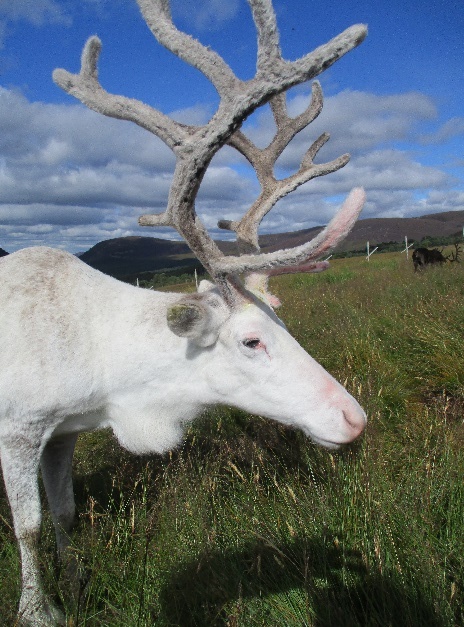 I met Mo last year on my summer reindeer trek and fell in love with him too. 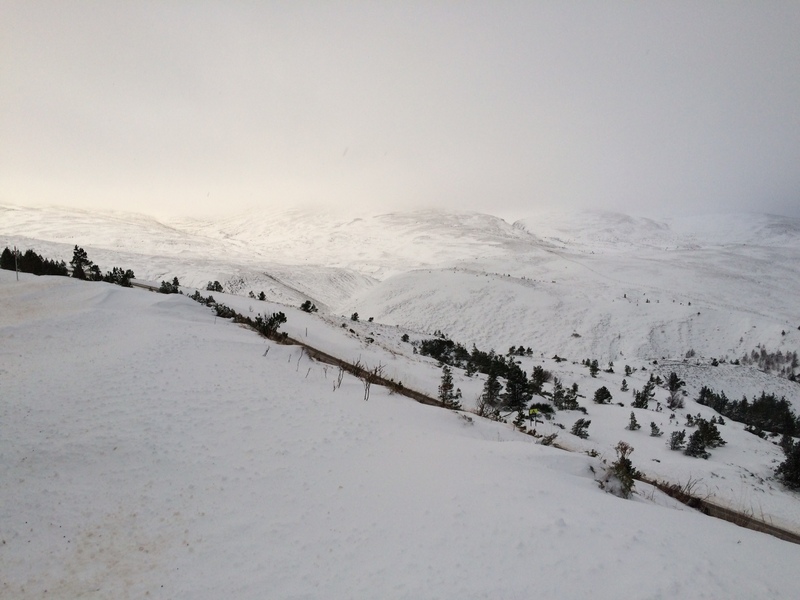 The Cairngorm Reindeer Centre is so special to me so when I found out I could volunteer there, I was so excited! 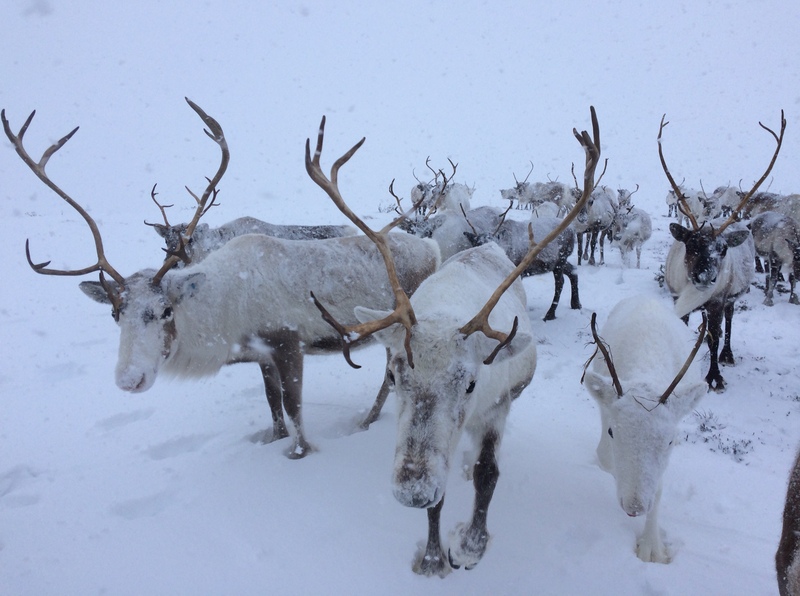 Working as a reindeer herder was extra special to me as I felt I fitted in perfectly with the reindeer and herders. When I first entered Reindeer House, I felt like I had been there for years and felt I was part of the family. I could just be myself and everyone is so friendly, special and understanding! I even made jokes which I normally don’t do! 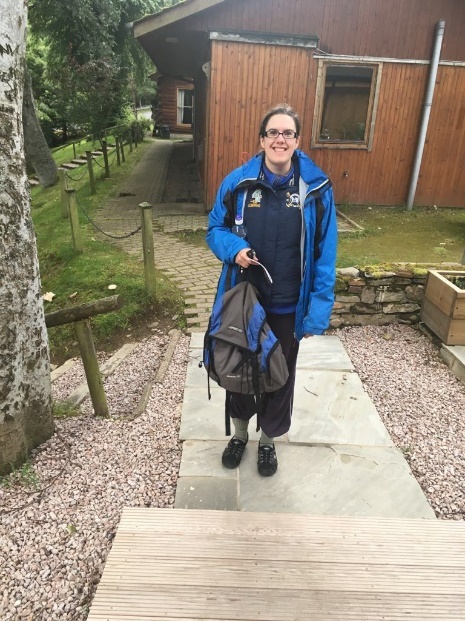 I have Aspergers Syndrome (a form of Autism) and Anxiety so being a reindeer herder was a very massive thing to me but being part of the team, I felt I hadn’t got any challenges and that I felt normal! I couldn’t believe how quick the days went! I was really sad when it was all over. I have gained so much from being a reindeer herder and I wish we live closer to the reindeer herd and reindeer herders. Went into Reindeer House and it was really brilliant seeing everyone and the dogs again. I met Andy who is originally from Kansas and Paddy (Abby’s boyfriend) and properly met Julia (who I had only seen from a distance last year). 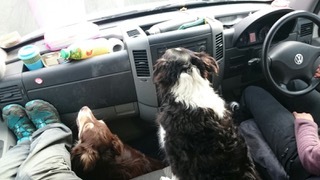 I helped Fiona fill up the reindeer feed sack with reindeer feed which is the reindeers’ breakfast then with Fiona, Abby and the 3 dogs called Sukie, Tiree and Murdo went to the ski carpark in the reindeer van to find any free ranging reindeer near the road. Sukie had jumped from the boot to me in the back and snuggled up to me and enjoyed lots of fuss and attention. She had remembered me from last year when me and my brother David had thrown sticks for her outside the reindeer centre. 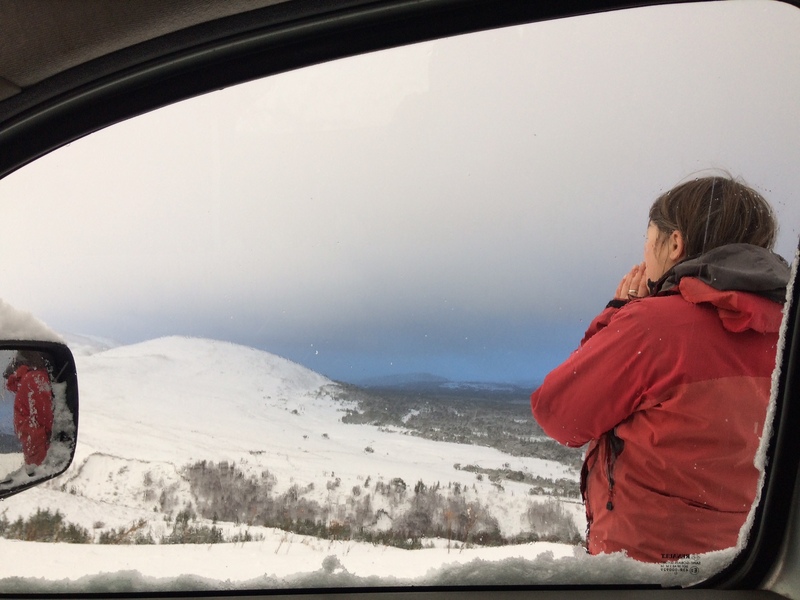 When we had got to the ski carpark, Sukie immediately sat up and looked intently out of the window looking at the mountains with her ears up and very alert. 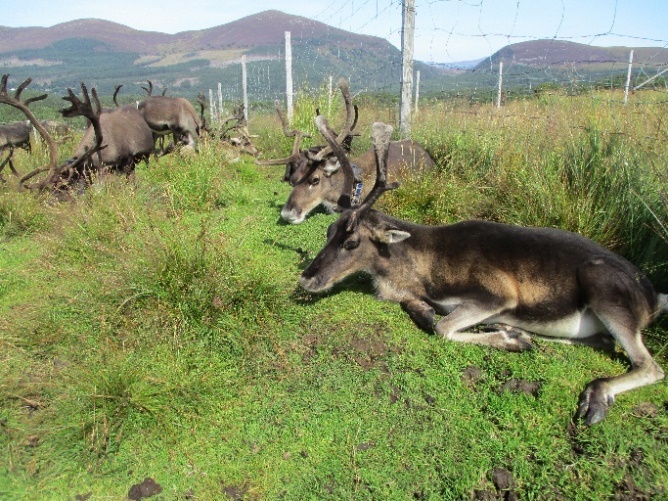 Then we then went to check the reindeer herd in the hill enclosure. 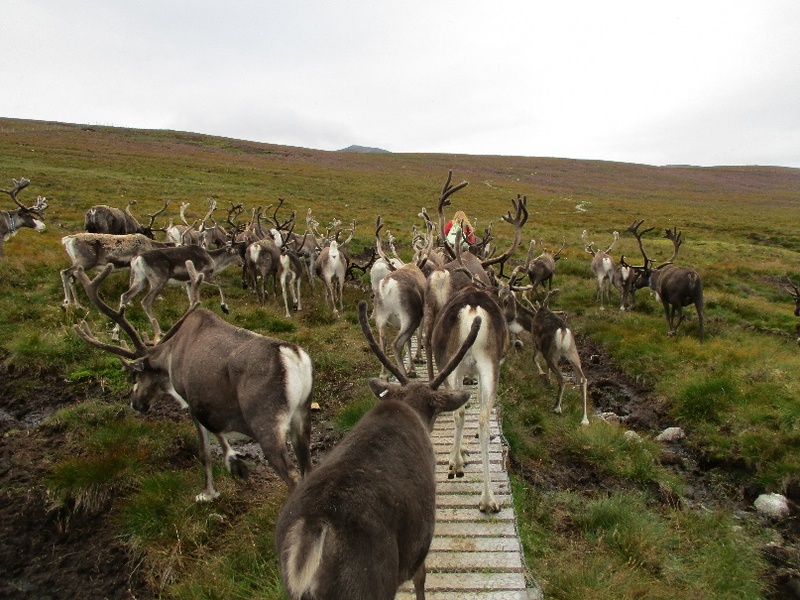 The reindeer were in the East Enclosure and followed us up the board walk. 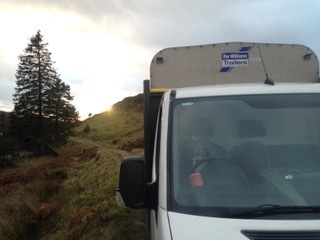 The midges were very bad up the hill that morning and they were swarming around us. Abby and Fiona fed the reindeer and then I was able to feed the last bit to them. 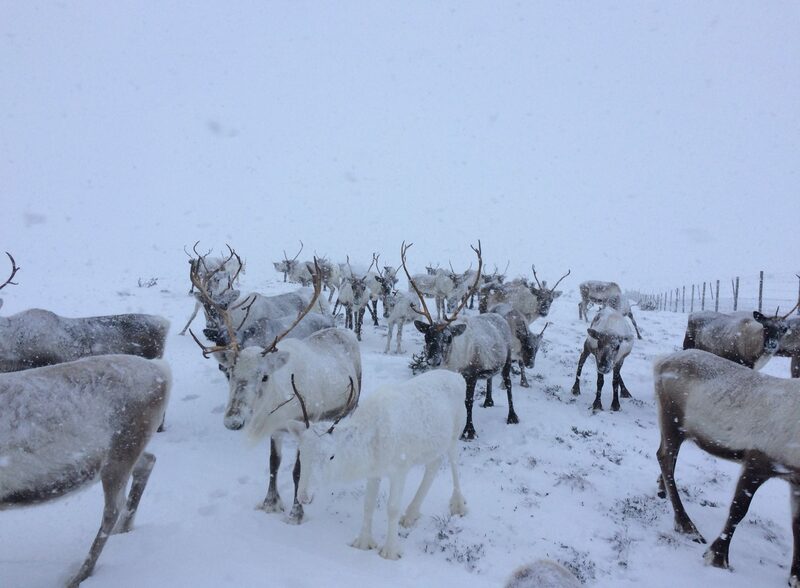 We counted them very quickly to make sure that all the reindeer are there and ok or identify who is missing. I spotted Mo and went to say hello and I was very excited to see him. 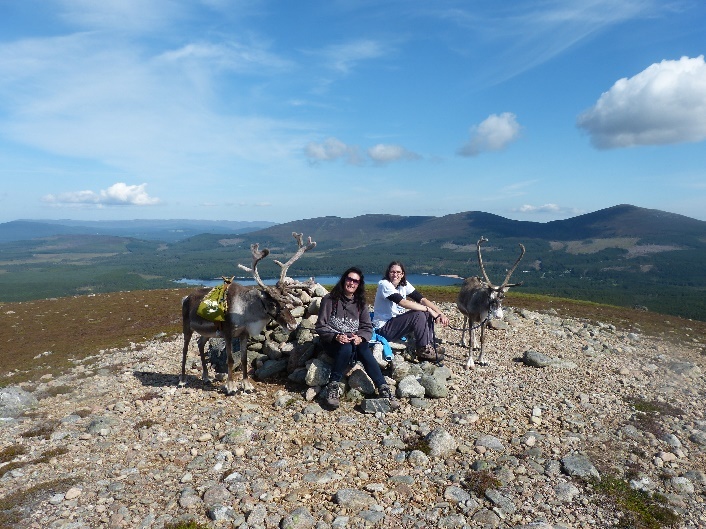 Abby and Fiona identified some yearlings (reindeer who were born last year) who had been brought over from The Cromdale Hills the day before and they hadn’t seen them for ages. They were really pleased to see them again and were trying to recognise them and guess who they were as they had changed quite a lot since they had last seen them. They had got much bigger, had antlers and got their summer coat on. Back at Reindeer House Imogen was hoovering up. Murdo started to play with the hoover by trying to get it which annoyed Imogen who sent Murdo to bed. Julia showed me how to poo pick the paddocks which we both did together. The 4 reindeer in their sleeping enclosure in the woods were coming near the fence knowing it was nearly their breakfast time. 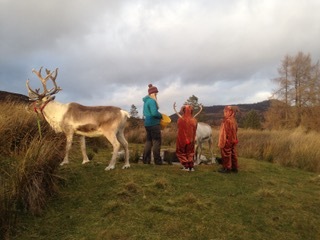 We then let the reindeer into the paddocks and they headed straight for their breakfast. Julia introduced me to the reindeer who were Beastie, Ost, Aonach and Nutti. We then had to get out of the paddocks as it was time to open it to the public. I was so excited to go in the reindeer office where lots of information is up around the room about each individual reindeer and which ones are in the hill enclosure. I had a herd list so every time I went up there, I could make notes on every individual reindeer till I got to know them all individually. They store all their paperwork and adopters folders in the office too with individual reindeer photos which is organised alphabetically and this is where the herders organise their Christmas events, do the adopters packs, answer emails, keep up to date with the social media pages and organization of the reindeer centre. I was amazed. Later I went on the 11am hill trip with Imogen. I was a bit nervous of the people at first but then slowly got more confident with them. I carried the hand feed up in the rucksack and went at the back to make sure nobody got lost or went the wrong way as the line can be sometimes broken up as going up a steep hill. I started to get to know each individual reindeer and making notes on them on my herd list. Noted their antlers shape and size, any markings, the coat colour, something that made them stand out, their personality etc. We all had lunch at the big long table at Reindeer House and it was lovely as everybody talked to each other and asked how their day was going and what they had been up to. Everyone was interested in each other. There wasn’t any sugar for my tea so Fiona said that you can also put a teaspoon of honey into tea to make it sweeter and it was very nice. I was also very interested of the defrosting milk on the draining board. It turned out they freeze the milk as it is used up so quickly as there is lots of people in the house so they don’t have to keep going to the shop every day to get more milk. We filled the reindeer feed sacks and the reindeer hand feed bags for the hill trips. We put 2 scoops of reindeer hand feed in each bag. On the 2.30 trip Julia the herder was telling the people about the characters of the herd and health and safety when hand feeding, I loved the feeling when they tried to nibble on your clothes or bag and how they got close to me when I had the feed bag. Some reindeer followed you as they knew what you have got in the bag and knew what was coming out of the bag. Nearer the end of the hill trip, we found all the reindeer just chilling and lying down at the bottom of the east enclosure by the gate. They were so laid back and it was really brilliant and special to sit and relax with them. Julia put out most of the reindeer feed and she let me give out the last bit which was brilliant. When everyone had gone, me and Julia was really surprised that it was 4:45pm. 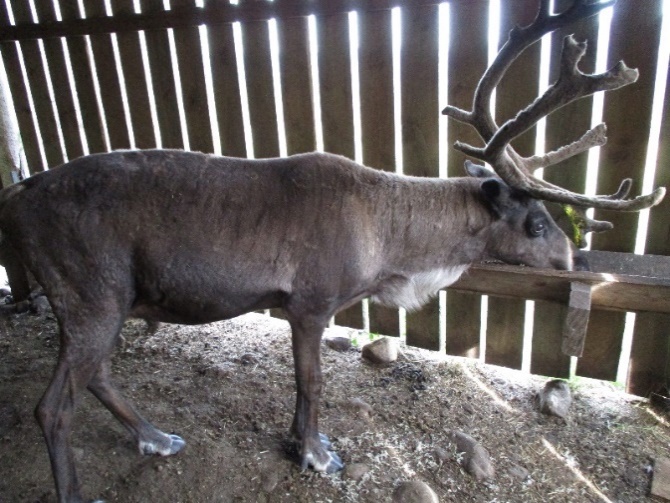 It was a very lovely sunny day and people had just loved being with the reindeer and loved finding out about them.